Isador’s Hand Fruit Program Delivers! 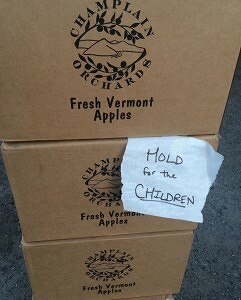 Apples headed to Kitchen Manager Patricia Hokanson at Oxford High School for use at Clara Barton & Chaffee Elementary Schools! The kids are back in school and thanks to Team Homegrown of Nichols College, we were able to bring some delicious local produce to the area elementary school kitchens. The Paint for a Purpose Fundraiser raised nearly $500 for our Hand Fruit Program that was used to purchase organic rainbow baby carrots from Pete’s Greens and eco-grown apples from Champlain Orchards, both in Vermont. 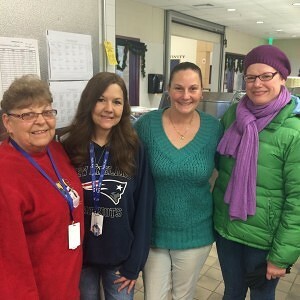 We met with the kitchen staff at Park Ave Elementary in Webster, Mason Road Elementary in Dudley and the Oxford High School for use at Clara Barton and Chaffee Schools in Oxford this morning and loved meeting with the excited staff. The community tribe that is present in the schools, with our customers and supporters is inspiring! Kitchen Manager Linda Poplawski (far left) and the kitchen staff at Park Ave Elementary with Nicole Hull O’Shea (far right). 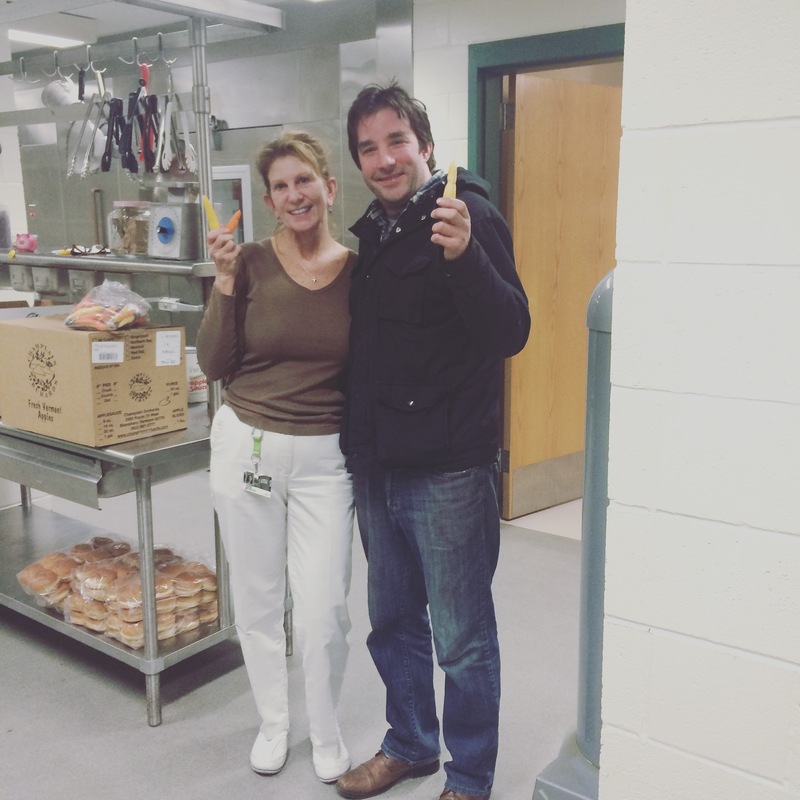 Mason Road Elementary Kitchen Manager Ann Menzone and Justin Szostakowski. We feel that kids should be excited about eating whole healthy foods and see that it can be fun as well as delicious. The purple carrots are orange on the inside, how fun is that?! When kids know where their food comes from and how amazing it tastes in it’s most basic raw form, it builds a foundation for a lifetime of healthy eating choices. 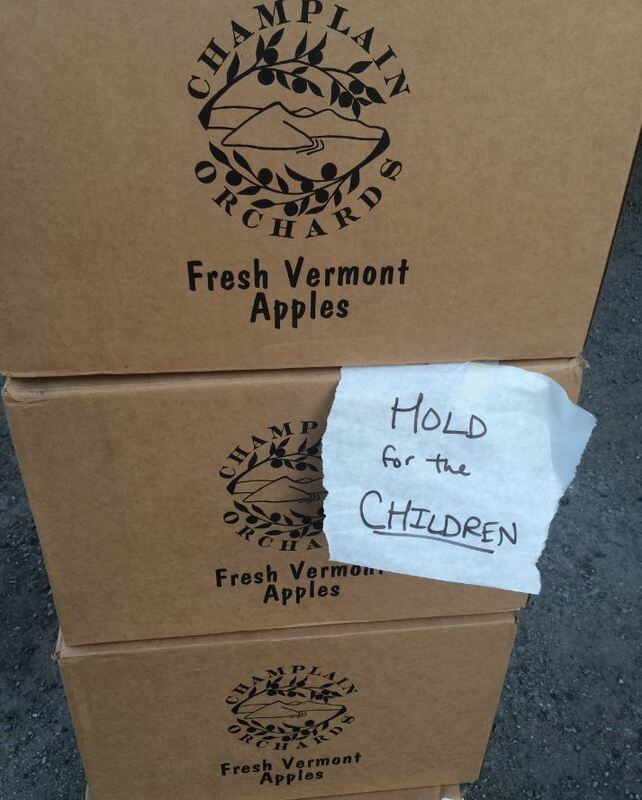 Isador’s Hand Fruit program was established several years ago and raises funds through community events in order to supplement Massachusetts public school lunch programs with organic fruit and vegetables. We have hosted 5 annual Chili Cook off contests with the proceeds going to providing fresh organic fruit for the children of Oxford, Webster and Dudley Schools via the Hand Fruit Program in conjunction with the sustaining efforts of the Webster Dudley Business Alliance. The 6th annual Chili Cook Off is coming up in Spring 2016! If you’d like to take part in supporting the Isador’s Hand Fruit Program or would like produce donated to your school, please contact nicole@isadors.com.